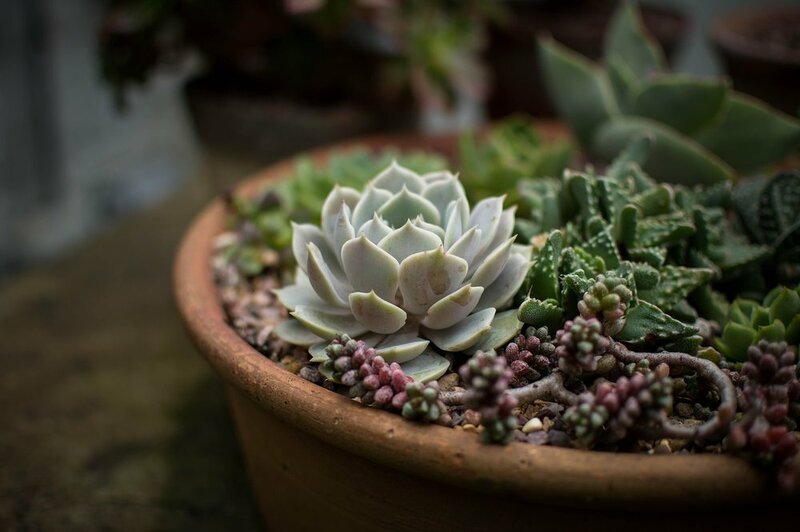 Whether you are new to gardening or simply have limited leisure time, container gardening may be the answer to your needs. They can be a welcome addition on a balcony or porch where conventional gardening may not be an option; on a deck or patio to add color or help soften hard lines; or in an area of the garden where the soil is poor or difficult to amend. Container gardens are an ideal solution for people in rental situations, those with limited mobility, or inadequate time to care for a large landscape. Herbs, vegetables, annual plants, and even shrubs can be grown successfully in containers. We regularly offer container gardening workshops. For more information check out our workshops page. We hand select our plants and color combinations, pick a complimentary container, and create everything onsite. We're happy to customize a container for your porch - or help you select one of our gorgeous creations. Looking to beautify your business or office? We lease custom container gardens to a wide array of businesses throughout the Triangle. To find out more please visit our landscaping page.